This is an update to the earlier Beebox post. I can’t beleive it. The beebox worked! Well, it mostly worked. It seems that I have a wasp filling in all the holes in the beebox. You can see in the picture the wasp is busy mudding in the hole. The wasp works fast. She filled in almost all the holes in about 1 week. The internet says that these types of solitary wasps will collect 11 to 13 caterpillars or beetle larvae and stuff them in the hole. So they are in fact good for the garden. Then they lay an egg on it and seal the hole with mud. Apparently they aren’t aggressive because they do not defend their nest. Also, I only saw one wasp at a time so there might have only been 1 wasp in the beebox. So it’s not all that bad. You can also see a tiny mason bee (I think) near the top right. I watched it climb out of the tiny hole and go warm itself in the sun. Apparently, the mud work of the wasp is smooth and the bee’s is rough. That is how you can tell them apart. In my case, it was easy because the bee only used the tiny holes. 1. put the box out early in the spring. I noticed that in June there were tons of mason bees around, but now, in July, there aren’t very many. Although it could be because I don’t have many flowers blooming at the moment. 2. the internet says to drilll 5/16 holes but I found that this is the size preferred by wasps. The mason bees like a tiny hole about 3/16. 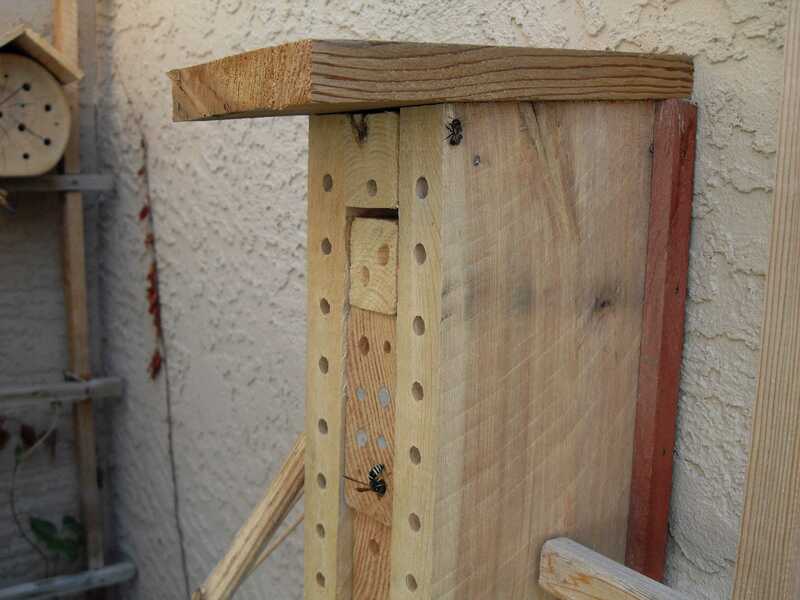 You can drill a variety of different size holes as there are many different kinds and sizes of bees (mason bee, leafcutter bee, carpenter bee, aphid eater bee, etc) But don’t make so many 5/16 ones. 3. put a roof on it. We had a rain storm and alot of the mud got washed away. 4. get some flowers. The mason bees really like the chives. 5. get dense wood. Cheap light wood has splinters and the bees hate that. They like a very smooth hole. I’ll keep my eye on the beebox and I’ll post an update if I see anything hatching out. This was written by Rob Carrelli. Posted on Sunday, July 12, 2009, at 12:27 pm. Filed under garden. Bookmark the permalink. Follow comments here with the RSS feed. Post a comment or leave a trackback.